Low cost due to high production numbers has seen an expansion in the availability of inverter welders. Ask any welding fabricator and they will tell you an inverter based machine will increase productivity in the workplace. You will find Inverter welding machines are prolific and dominate the metalworking trades for this reason and also the reduced capitalisation cost to get them to the welding operator. Some of the latest features that make these machines the best choice for not only industrial purposes but also for home workshops are the full multi process capabilities (GMAW / FCAW, MIG, MMAW, GTAW) and standard compliant voltage reduction device also known as VRD. Inverter Machines from Tokentools are compliant to AS 60974 standards series, feature digital voltage and amperage meters,enclosed in IP21S rated cases. We stock inverter tigs, migs arc machines and also inverter plasma cutters. Having specifications like MIG (GMAW/FCAW), Stick (MMAW), Lift TIG (GTAW) process, an input voltage supply of 240 volt AC +/-5%, 50Hz (15A plug) and current range from 5 to 1000 amps make our Tokentools machines the right welding tool to use for all types of welding jobs. 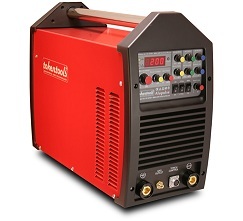 Not only for inverter welders but for all types of our welders we offer our industry first and industry leading Five-Year Warranty, 30-Day Money Back offer. These excellent policies demonstrate the confidence in our quality and after selling in Australia for over a decade we are still around to prove our longevity. We never compromise on quality and provide overnight delivery between Melbourne and Brisbane. These are some of the important reasons that our customer base has been growing exponentially day after day. Our inverter welders come with genuine industry standard torches and accessories. You can buy spare parts and welding consumables from us or your local welding supplier. We develop our range of models of welders with professional quality. Whether you are a farmer or an engineering business you will not be dissapointed with the operation nor the performance of Tokentools welding equipment. Switching Transistors Most of the Tokentools inverter welding machines contain Infineon IGBT transistors manufactured in Germany thus we ensure the highest quality product available. Needless to say, our machines and other related products are of high quality and as our customer you be impressed by the price / quality equation of the gear for sale via our online store. For more information about inverter welders please call our staff on 1300 881 991.